I'm a Hawaiian Shirt guy. I'll never apologize for that. My relatives try to find the most outrageous Hawaiian Shirt, I'm thinking in hopes that I'll be too embarrassed to wear them and give it up. It'll never happen. My dogs have all followed suit and get plenty of compliments. I, on the other hand, continue to buck all fashion trends according to conventional fashion standards. It's OK. Rusty and I are trendsetters. 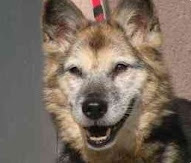 TikiPaws has been a supporter of SeniorPooch.com since the beginning; reposting, liking, and otherwise sharing our posts to help get the word out. Recently I picked up a couple of things from them and couldn't be happier with the service. When I mentioned on Twitter donating a shirt they sent me that was a bit snug on Rusty, they immediately jumped in to let me know that I could send it back to them for credit or refund (check out their site for exact wording). I'm a customer service wonk, so this goes a long way for me when I'm deciding who to do business with online. To be fair, I figured it would be small for Rusty before picking it up. Every Monday is "Oh Poo, It's Monday" where you get a box of 50 poop bags with every order. For a poop bag, they're better than I'm used to with the generic brand that I pick up at the big box stores. Apparel is their big thing, but they also have costumes, toys, beds, and all natural treats. 20% of their collar and leash sales goes to Free Spirit Siberian Rescue and they have a number of other causes that they support throughout the year as well. Great products, awesome service, and huge hearts. What's not to love about them. Check out their full catalog online. 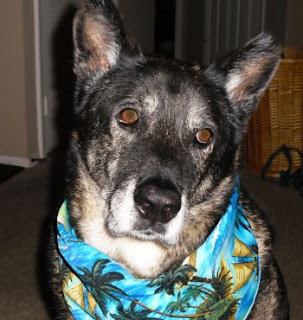 Disclaimer: As of the time of this writing, SeniorPooch.com is a customer of TikiPaws.com. It's as simple as that. No other relationship other than the awesome service and friendship that they display to all in the animal advocacy community is what this review is based upon.